Links to websites for Los Angeles Event Listings, Calendars and Tickets. Hollywood Sign - Locations from which to view and photograph the Hollywood Sign, with a focus on areas of interest to tourists who have limited transportation options. You can take a shuttle to some view points, or go on a guided tour that includes a view of the sign from an overlook of the city on Mulholland Drive. If you don't want to spend the time to get near the Hollywood Sign, you can download a close-up photo of it for free. Hollywood Sign Official Website - The sign's official website, produced by the Hollywood Sign Trust and the Hollywood Chamber of Commerce. There is a photo history of the sign, including facts and a timeline. You can also find trivia, plus news and upcoming events. There's a live webcam running 24/7, although obviously the sign is only visible in the daytime. Shopping in Hollywood and nearby, including Hollywood & Highland, Universal CityWalk, Melrose Avenue and Robertson Boulevard Shopping District in West Hollywood. Attractions on Hollywood Boulevard - The "heart" of Hollywood is at the intersection of Hollywood Blvd and Highland Avenue. There you will find most of the most famous Hollywood tourist attractions such as the hand/footprints in the cement courtyard of the Chinese Theatre, the Dolby Theatre, Hollywood and Highland entertainment complex, Madame Tussaud's and more. This area also holds some of the most famous celebrity stars in the Hollywood Walk of Fame (stars inlaid on the sidewalk). A short walk away are more famous tourist attractions, such as the Hollywood Wax Museum, Guinness World of Records Museum, the Hollywood Museum and Ripley's Believe it or Not Odditorium. Academy Gallery & Grand Lobby Gallery - The Academy's Grand Lobby Gallery and Fourth Floor Gallery offer free exhibitions that are related to the film industry, and are open to the public Tuesday through Sunday. Both galleries (as well as the Samuel Goldwyn Theater) are located at the Academy Headquarters in Beverly Hills. The Linwood Dunn Theater is at 1313 Vine Street in Hollywood (at Fountain Avenue, a half mile south of Hollywood and Vine Metro station). The Samuel Goldwyn and Linwood Dunn theaters offer exhibitions on scheduled dates, which you can find on the calendar at the Academy's website. Celebrity Driveways - Photographs of driveways of the rich and famous. Celebrity & Movie Stars Homes Tours - Some of the most popular guided tours are the tours or movie star homes. 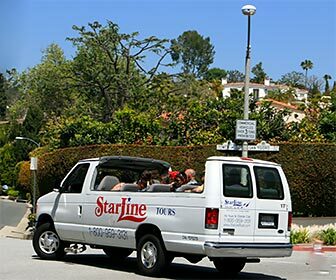 Starline Tours of Hollywood offers a two-hour Movie Stars Homes Tour that takes you by current homes of top stars like Jennifer Aniston, Tom Cruise and Dr. Phil, as well as former homes of super stars like Michael Jackson, Madonna, Frank Sinatra and Elvis Presley. The tour includes a drive past other hangouts of the rich-and-famous, such as Rodeo Drive, Bel Air, Beverly Hills and the Sunset Strip. 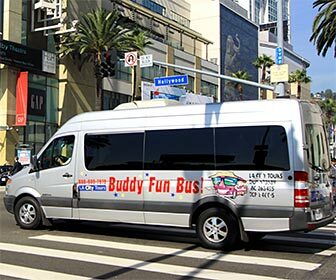 LA City City Tours offers a two-hour tour that includes a stunning view of the city, the Hollywood Bowl and the Hollywood Sign from atop Mulholland Drive! See the stars' homes and then look down on the city below! You will also see Bel Air and the Sunset Strip. You might not actually see a celebrity, but imagine the thrill of seeing their neighborhoods, the streets that they drive on and the house that they call home. These tours are far better than buying a worthless "map of the movie star homes" and driving around in a rented car looking for those locations. Those maps can be quite outdated. Instead, take a Movie Stars Homes Tour driven by a professional who already knows where to go. They'll give you the scoop on the REAL homes of the stars. Starline Tours: Movie Stars Homes Tour - (2 hours) - Current and past homes of movie stars and celebrities; Sunset Strip; Rodeo Drive; Beverly Hills, & Bel Air. Celebrity Home Guide - Seeing Stars' comprehensive guide to the stars' homes. Haunted Hollywood - Stories, websites, books, a DVD and a professional guided tour that describe Hollywood hauntings and ghost stories, as well as gravesite locations. Hollywood Chamber of Commerce - Demographic data, visitor information, Hollywood Sign history, and Walk of Fame history. Hollywood Boulevard Links - including Hollywood & Highland Center, Hollywood Walk of fame, Chinese Theatre courtyard cement impressions, the Dolby Theatre, Madame Tussaud's and many more attractions. Museums in and near Hollywood, such as Hollywood Bowl Museum, the GRAMMY museum and Hollywood Museum. Also includes Miracle Mile museums: Page Museum at La Brea Tar Pits, Los Angeles County Museum of Art (LACMA), Petersen Automotive Museum and the Folk Art museum. Hollywood Bowl - The Hollywood Bowl is L.A.'s premier location for thrilling summer evenings of extraordinary music, dance, and film, fine dining under the stars, and, of course, spectacular fireworks! Calendar of Events, Online Store, Bowl info. Hollywood Bowl Museum - features history, photos, posters, videos, and rock memorabilia from events at the Hollywood Bowl. Hollywood Christmas Parade - The very first parade, in 1928, consisted of only one actress, Jeanette Loff, and Santa Claus. Today, the holiday season is kicked off with a star-studded extravaganza with nearly 100 celebrities offering their holiday cheer to the people of Southern California and the World. Hollywood Farmers Market - Sunday, 8 AM to 1 PM, Ivar Avenue and Selma Avenue (between Hollywood Blvd and Sunset Blvd). Fresh fruit and produce as well as baked goods and prepared foods. Also features street musicians, community organizations and free events (such as cooking demos, cookbook autographs, kids workshops, and family-oriented festivals). Hollywood Forever Cemetery - Founded in 1899, it is the resting place of hundreds of Hollywood's greatest stars. Recently refurbished to its original splendor, the cemetery attracts visitors from all over the world. On Saturday evenings during the summer, Cinespia shows classic films at the cemetery. 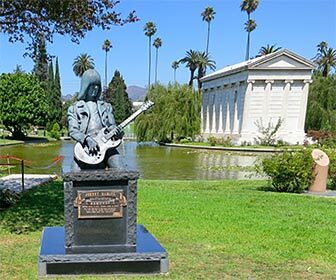 Hollywood Forever Cemetery Historical Tours - guided by historian Kerry Bible, a 2-hour+ walking tour at Hollywood Forever Cemetery. Three tours are available. Tours are normally offered on the weekends but check the schedule for a full listing. In Hollywood, this is an ongoing attraction. 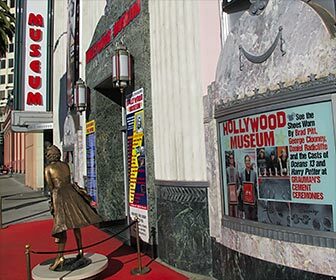 Hollywood Heritage Museum - (across from Hollywood Bowl) is dedicated to the early days of filmmaking in Hollywood. The Museum features archival photographs from the silent movie days of motion picture production, movie props, historic documents and other movie related memorabilia. Also featured are historic photos and postcards of the streets, buildings and residences of Hollywood during its heyday. Mulholland Drive - Scenic views of Los Angeles and San Fernando Valley. Driving directions and maps for the popular scenic roadway. Where to find the best views, including the Hollywood Bowl Overlook. Oscar Night - The Academy Awards web site. Famous award ceremony for television and motion picture. See also, Academy of Motion Picture Arts and Sciences. 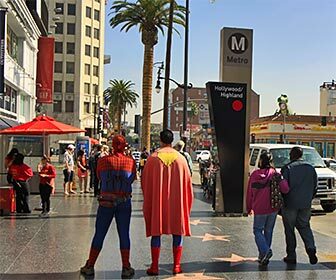 Hollywood Guided Tours - The easiest way to see L.A.'s best attractions is to let a pro show you around. Here are a variety of guided tours of Los Angeles, from the time-tested Grand Tour to the brand-new helicopter tours. See beaches, movie star homes, downtown and all of the attractions through the eyes of an expert! This is a great way to explore our great city, even if you've been here before. TV Studios and Show Tickets - Find out how to attend TV talk shows and game shows in Los Angeles. Also includes movie and TV studio tours. Hotel Accommodations in Hollywood - Hotel information, rates and online availability for hotels in Hollywood. West Hollywood - attractions and tourist destinations in West Hollywood, including the Sunset Strip, Santa Monica Boulevard attractions, Millions of Milkshakes, restaurants and concert clubs. CityWalk Hollywood - An outdoor mall and entertainment center, lined with shops and restaurants. CityWalk also offers easy access to Universal Studios. Even if you don't go inside the theme park, you can take pictures of the globe near the front entrance of Universal Studios. Universal Studios Hollywood - The world-famous movie studio and theme park featuring movie studios, tours, attractions, rides, restaurants and more. Get a behind-the-scenes look at special effects techniques. 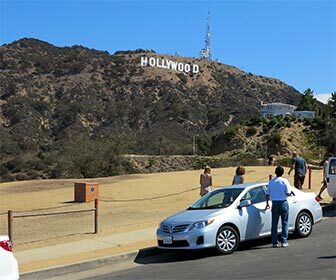 Locations from which to view and photograph the Hollywood Sign, with a focus on areas of interest to tourists who have limited transportation options.